Top author R.J. Ellory caught out praising his own books on AMAZON – and writing disparaging reviews of his rivals’ works. RJ Ellory is one of the most talented authors of today. His ability to craft the English language is breath-taking. You find yourself experiencing so many emotions as you read this book and ….you don’t want it to stop. When I did finish I thought . . . Wow that is an amazing book, give me more! It really is a magnificent book, ignore all dissentors and naysayers, this book is not trying to be anything other than a great story, brilliantly told … Whatever else it might do, it will touch your soul. When he was caught Ellory said: I wholeheartedly regret the lapse of judgment that allowed personal opinions to be disseminated in this way and I would like to apologize to my readers and the writing community. Thriller writer Stephen Leather also admitted going online to “create a buzz” …..
Fall of 2010, Todd J. Rutherford started GettingBookReviews.com, initially saying that he would review a book for $99. When some clients came forth asking for a chorus proclaiming their excellence, Todd said that for $499 he would do 20 online reviews. A few people wanted an orchestra, so he said that he would do 50 reviews for $999. There were immediate complaints in online forums that the service was violating the sacred arm’s-length relationship between reviewers and authors. Soon, Todd was taking in $28.000 a month; the wheels of online commerce run on positive reviews. One of Todd’s clients, who paid for hundreds of book reviews, became a best seller. The first self-published author to sell a million e-books through AMAZON was John Locke. Most of his nine novels are suspense tales. Then he published a nonfiction book “How I Sold 1 Million eBooks in Five Months.” He priced his novels at 99 cents. And he was one of Todd’s best clients . . . According to the media, in 2015 an estimated 600.000 self-published titles will come out. And many will be wanting “attention” . . . Author Solutions/Xlibris was bought by Penguin UK – Wall Street Journal of July 20. No wonder I was stonewalled by Xlibris regarding my royalty checks for three books. They had been issued with my name misspelled (on purpose I am sure). I was told by Xlibris to return them and I would receive new checks. Nine months ago . . . still waiting. Goodbye $$$$$ ! A book reviewer disliked my novel The Blue Mirror; it reminded him of Thomas Pynchon’s “convoluted” stories. 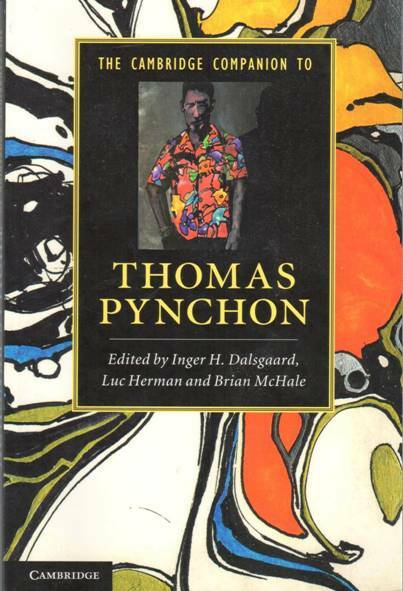 I had no idea who Thomas Pynchon was so I read “The Crying of Lot 49.” I chuckled a lot; and agreed my book could be considered “convoluted” – it so happens I enjoy writing such stuff . . . like Pynchon, eh? To support food diversification, the Bogor Agricultural Institute has developed from local plants an artificial rice ---or ANALOG rice; they have analogous characteristics to conventional rice. The products have been processed to have similar characteristics to food made from rice by adding fiber, antioxidant substances or other ingredients. 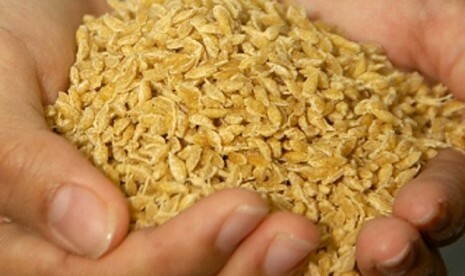 The artificial rice can be made from corn, sorghum, sago and tubers and is ideal for a customized diet. The advantages of artificial rice are that it can be cooked through both conventional and modern means, and people do not need to wash it before use. 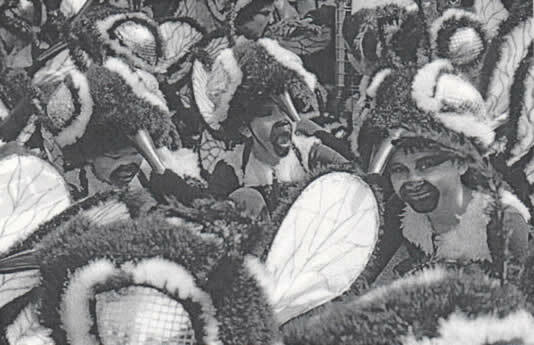 At the cultural festival in Metro Manila, Philippines, known as Buyogan festival, performers wear bee costumes. 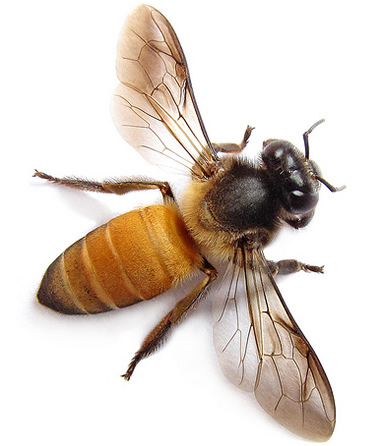 The honeybee is native to Europe, Asia Minor and Africa. It is impossible for bees to get across a water barrier. Panama was the land-bridge for bees from South and Central America. Bees came to the US in the early 17th century along with German and English colonists. 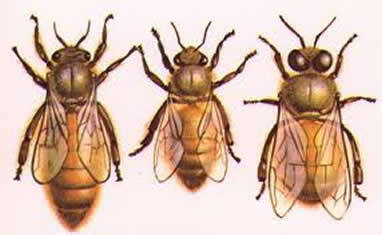 There are 20.000 species of bees; they evolved from predatory wasps. Beetles already existed to pollinate plants but bees became better pollinating agents than flies and butterflies. Bees can distinguish colors with the exception of red – red flowers are pollinated by butterflies and other insects. A beekeeper is known as an “apiarist”. 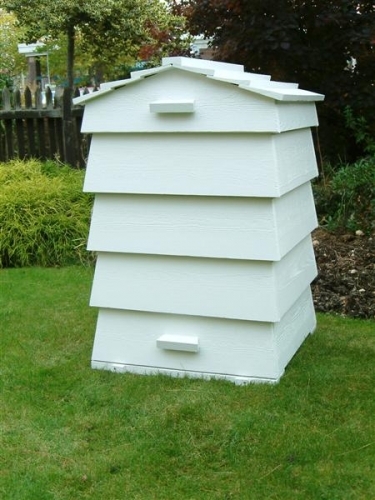 And an apiary is a collection of beehives tended for their honey. In antiquity honey was the “nectar and ambrosia” – the divine food --- of the Greek gods. From ancient times honey has been valued for its medicinal virtues: antiseptic properties; for coughing syrups, against diabetes, for facial masks, and incorporated in hand creams. Honey was fermented for 40 days, 3 parts water and one part honey, to make the potent “mead” for communicating with “the other world” (getting drunk). Honey was used in making breads and cookies. 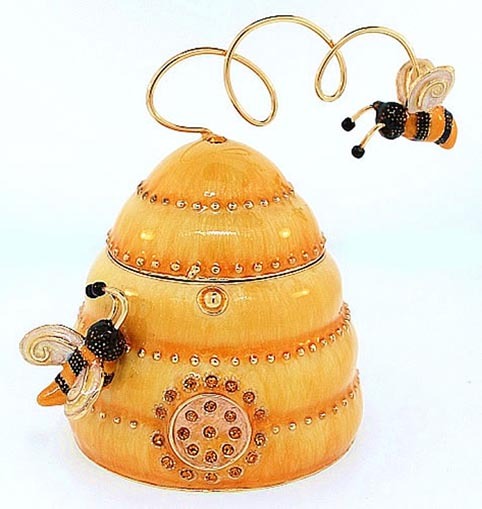 Honey was a prestigious/precious commodity creating words like: “mellifluous” – mel/honey and fluus/flowing. Beeswax was used for lip-salve, earplugs, candles (profession was known as “chandlers”), and for making effigies (Madame Tussaud). 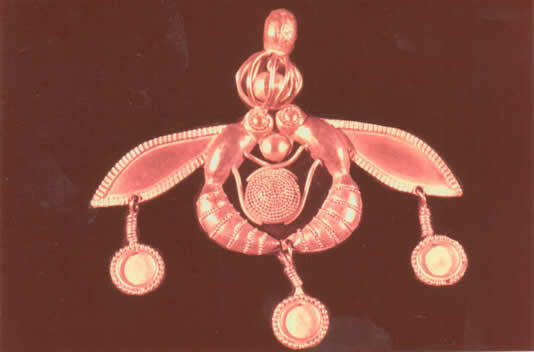 Emperor Napoleon wore a bee-studded coronation robe. 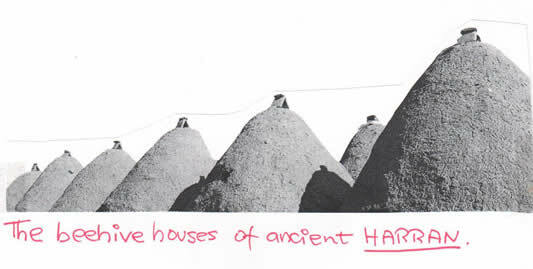 The ancient papal miter was a “modified” beehive to resemble the workers of the Church. "...Birds do it. Bees do it. My smile is a mile long! known as bee-milk, is secreted from salivary glands of the worker bees. become future queen bees. The development period for the queen is 16 days. The queen gives off 30 pheromones that keep her bees calm to be productive. She sends them chemical instructions about what to do. The queen cannot make wax or honey. copulate in the air with drones from other hives –that die in the encounter. She stores up enough sperm inside her body to last for her lifespan (5/6 years). attended by a small group of worker bees who feed and clean her. A worker bee is an infertile female; it takes 21 days for her to become an adult. During her lifespan (6 weeks) she performs numerous jobs according to “age” (depends on gland development). When she wriggles out of her cell, she grooms herself, keeps brood larvae warm, receives food from other bees and cleans cells. When she is three days old she will feed older grubs and when six days old feeds younger grubs and the queen. At two weeks her glands can make wax that she produces in her belly, so her job switches to that off comb-building and maintenance of the hive. When a cell is full with nectar, she caps it with beeswax. She may guard the entrance of the hive to keep away wasps, ants, mites, wax moths and birds. She may ripen nectar into honey, store pollen in cells, or keep the colony clean. At three weeks, an adult, she will start foraging, spending the rest of her days in search of nectar which she collects in a honey sac, a pouch inside her body. She may receive nectar from other bees which she puts into the cells and flap her wings to evaporate the nectar water into honey. To communicate on her food source, she dances for her coworkers. She performs a fast round dance for nearby nectar, a waggle dance for food sources further away, and a slow dance for honey far away. She exposes her abdomen to the other bees’ “feelers” so they can smell the flower scent on her. Swarming occurs when a queen and some of her workers move to a new location to start another colony (about 50.000 bees per nest). A COLONY needs one acre for collecting nectar, thereby fertilizing apple trees and other fruit-bearing trees and shrubs like blueberries. Climate change is “affecting” bees’ ability to pollinate (by upsetting life cycles). The most important factor is “timing” --- when flowers open and bees emerge from hibernation. When these cycles are out of synch it results in fewer plants being pollinated and bearing fruit. The decline of the honeybee is not a myth! Bee mortality is a major implication for farming and food supplies as------over a third of the food we eat depends on pollination! COLONY COLLAPSE DISORDER is caused by the parasite that lays its eggs in the bee’s abdomen. A week after the bee has died the fly larvae pushes its way into the world exiting from between the bee’s head and mid-section. Also, the collapse is caused by viral and bacterial infections (fungus), pesticides as well as the destruction of bee-foraging areas due to over-development/housing and loss of floral abundance. Asian hornet threat from China arrived in plant pots to France. Hornets group themselves in front of a beehive and decapitate the bees---stripping off the wings and legs as well as the bee’s thorax and abdomen---- making a porridge to feed their own young. Asian honeybees have carried a parasite to Europe where the colonies are now declining. 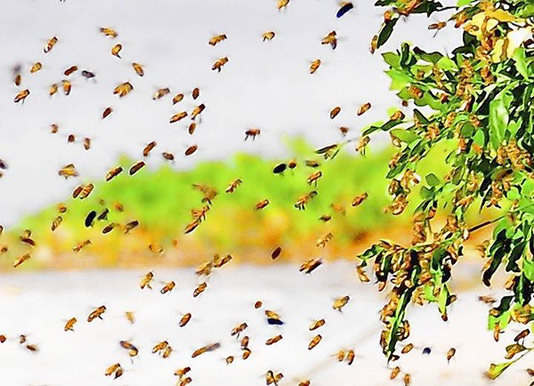 Researchers are working with queen-bee producers to find bees that are resistant to the disease and other pests, thereby help building a tougher honeybee. Declining populations of bees and other flower-visiting creatures have raised concerns about pollination levels. 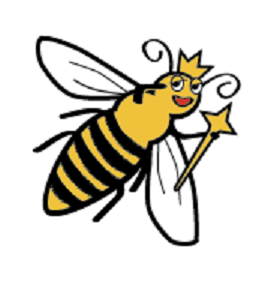 The political structure of the beehive: Queen (ruler), workers and drones. for America’s “religion of work”, the goodness of commerce.